DULUTH, Ga. - The Examiner is reporting that a 19-year-old male identified as Julio Trinidad was shot and killed at The Falls Apartment complex located in the Duluth, Ga. area after midnight on July 18, 2013. Julio was a resident of the apartment complex and there is speculation that the shooting took place during a robbery attempt. According to the police, he suffered what appeared to be at least one gunshot wound to the head but the extent of the injuries will be determined by the Gwinnett County Medical Examiner. The Falls Apartment complex is located off of Satellite Blvd. 2 miles from I-85. "Welcome to The Falls At Gwinnett Place Neighborhood... Where We Have Safe And Fun Living In Duluth, GA Apartments!" In some cases, deaths that are caused due to dangerous property conditions or poor building maintenance, either inside or outside a structure, are legally coined "premises liability" incidents. These incidents can occur at commercial buildings (stores or offices), residences (private homes or rentals), or on public property (parks, streets, or public transportation). There are guidelines that help determine who is legally responsible when it appears that a property condition causes a death or serious injury. The owner of a property has a legal responsibility to anyone who enters his or her property as a tenant, not to subject that person to an unreasonable risk of injury because of the construction, design or condition of the property. The property owner has complete control over the safety of the premises that they own and the visitor has none. For example, if the owner of an apartment building does not fix broken lights, security cameras, locks or gates, they can be held responsible for crimes that are committed. Simply put, if the person injured is using the property in an unsafe way, the property owner is not responsible. If you have been seriously injured or lost a loved one as a result of a premises liability accident in the Duluth area, or the state of Georgia, please contact us today to discuss your case or call right now at 1-800-898-HAYS. The Atlanta Premises Liability Attorneys at the Law Offices of Gary Martin Hays and Associates fights for the rights of people who have fallen victim to violent crimes due to premises liability. According to My Fox Atlanta, a car accident in mid-July resulted in three deaths and six injuries after several cars were pinned beneath a tractor-trailer. The accident occurred at approximately 1:00 a.m. on Friday night and involved the tractor-trailer as well as a pick-up truck, a Jeep and a Ford Escape. Reports from the initial investigation conducted by the police indicated that the crash may have started after the pickup truck made a left turn and collided with the tractor-trailer, which was going in the opposite direction. The tractor-trailer rolled over in the accident, pinning two cars beneath it. Our Atlanta truck accident lawyers know that whenever a truck is involved in an accident, rollovers are likely to occur. 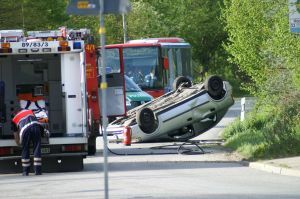 Unfortunately, these rollovers can be extremely dangerous or even deadly, especially when vehicles are in close proximity at a busy intersection. The accident took place in Georgia Highway 365 in Gainesville, closing northbound lanes on Highway 364 for almost nine hours. It allegedly began when the pickup truck driver turned left into the path of the truck. The tractor-trailer was carrying frozen chicken products. The driver of the pickup truck that collided with the tractor-trailer was killed. The passenger in his pickup truck was also killed. Two other vehicles subsequently became involved in the crash, becoming pinned under the tractor trailer when the accident caused it to roll over. Tractor-trailers, like all trucks, have a high center of gravity. This can make the trucks more likely to roll over, especially when drivers are speeding, going around curves or- as in this case- involved in an accident. Factors such as a heavy or unbalanced loads can also make a tractor trailer more likely to flip over, although there is no reported evidence at this time indicating that the tractor trailer here was not correctly loaded. 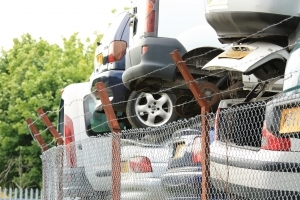 Unfortunately, when trucks and tractor-trailers do roll over, it is not uncommon for cars to be pinned underneath. These vehicles tend to be very large and when they tip, any other cars in close proximity could become caught underneath. This could do devastating damage to the vehicle and potentially cause serious or fatal injury to all drivers and passengers involved. In this case, the accident happened at a very busy intersection, which meant that it was even more likely that cars would end up being crushed by the rollover. When vehicles are in close proximity with no place to go, the chances are high that a truck rolling over will endanger them. For those who were affected by the rollover and who sustained injury, it may be possible to take legal action. In this case, it was the tractor-trailer that caused injury. However, the underlying crash may have been caused by the pickup driver and the tractor-trailer driver may have done nothing wrong. This means that there are complicated issues of liability regarding who is to blame. Potential defendants in an injury lawsuit could include the pedestrian, the pickup driver, the tractor-trailer driver or the company that employs the tractor-trailer driver. But injured victims will need to show that something went wrong or that the defendant was negligent in order for the victim to be compensated. If you have been injured in an Atlanta truck accident, contact Gary Martin Hays & Associates at 1-800-898-HAYS. Early this July, a tragic accident occurred on I-75 in Georgia, when a pedestrian was hit by a car. Unfortunately, this lead to multiple vehicles becoming involved in a pile-up. Conflicting reports indicate that there were between five and seven vehicles involved, while 11 Alive indicates that there were multiple people injured including at least one critical injury. Our Atlanta accident lawyers know that multi-car pileups often raise many complex legal issues regarding who was to blame for the accident. In this case, however, the investigation of the crash has been further complicated by the fact that many drivers are alleged to have broken the law. According to 11 Alive, the recent multi-car pileup occurred at approximately 4:30 in the morning on the fifth of July. A pedestrian was on I-75 and was hit by a motorist. The pedestrian reportedly faces a charge of pedestrian in the roadway. When the pedestrian was hit, multiple other vehicles also become involved in the accident as well. Multi-car pileups typically happen when other drivers come upon an accident scene and are not able to react in time to avoid becoming involved in the crash themselves. These accidents are more likely to happen when visibility is compromised, such as during bad weather or when it is dark out. If drivers are not paying attention or are impaired, then multi-car pileups are also more likely to occur. An investigation into the accident has revealed that the pedestrian was not the only one who may have been breaking the law in a way that contributed to this multi-car pileup. Five of the drivers who were involved in the crash have reportedly been charged with driving under the influence (DUI) in relation to the accident. These drivers may have been consuming alcohol to celebrate the Fourth of July, as this holiday is a popular drinking day each year, resulting in an annual increase in DUI accidents. If law enforcement is able to prove that these drivers were over-the-legal limit, then the drivers could face jail time and other criminal penalties. For accident victims involved in the crash, the multiple potential drunk drivers coupled with the fact that a pedestrian started the chain of events raises many different complications. Those involved in a car wreck or pedestrian accident may normally take legal action against the person who was responsible for causing the wreck to occur. In this case, there may have been lots of drivers engaged in dangerous or risky behavior who could potentially be liable for damages. In cases where it is unclear how an accident happened, law enforcement will generally conduct an investigation to try to get to the bottom of the issue. Injured accident victims who wish to pursue legal claims for damages may also consider working with an accident reconstruction expert who can evaluate evidence and help them to recreate the timeline for the crash to shed light on who was at fault. If you have been injured in an Atlanta car accident, contact Gary Martin Hays & Associates at 1-800-898-HAYS. Do I need a lawyer for my workers’ compensation claim? If you have been injured on the job here in Georgia, there are some very important details that you need to know about workers' compensation law. First, let's define exactly what workers' compensation is. "Workers' compensation is an accident insurance program paid by your employer which may provide you with medical, rehabilitation and income benefits if you are injured on the job. These benefits are provided to help you return to work. It also provides benefits to your dependents if you die as a result of a job related injury." Before we talk about whether or not you need a Georgia workers' compensation lawyer, let's discuss some important things you need to know if you have been injured on the job. Lawyers that specialize in workers' compensation claims will know how to navigate the process specific to your injuries. The goal of any lawyer should be to get you the treatment you need so that you can begin healing to the best of your ability as quickly as possible. So you've been hurt in a car wreck here in Georgia and it was not your fault. The insurance company reluctantly agreed to pay to have your car repaired. You have been going to your doctor for medical treatment, and your health insurance company has been paying the bills. Surely this is a claim that you can handle on your own against the insurance company and their lawyers, right? There are far more landmines in your claim than you might realize. Are you getting a fair settlement? Will you have to repay your health insurance for any amount that they paid to your health care providers? If so, how much? Does the settlement leave open the possibility that their insured could come after you for any damages or injuries sustained in the wreck? Do you know if you have to send an "ante litem" notice to the Defendant before you can proceed with your claim? Do you really have a full understanding of what the future may hold for you medically? And did you get a report from your treating physician(s) to include in your demand package? If the claim does not settle, have you irreparably damaged your claim to a point where no lawyer wants to step in and handle it for you? Will you know what to do if the insurance company is taking their time getting back with you, or worse yet, completely ignores you? Do you have the time to collect, decode, and understand all of your medical records from all of your health care providers? Are you available at all times during the work day to make calls and wait for return phone calls from the insurance company or your doctors? Will you know how to secure eyewitness statements? What if you can't locate that witness? Do you have the ability, time or resources, to locate him/her? Are you comfortable talking with your employer or HR department to get the lost wage information - in a form that the insurance company will understand and not question? What if they ask you to sign a medical authorization that allows them access to your entire medical history? What if the at-fault driver had no insurance - or not enough? What if you are asked to go to a medical appointment to meet with one of the insurance company doctors? Do you have the time, the temperament, the patience, the knowledge to handle this claim on your own? Getting back to the original question... should you hire an attorney? Not all cases are the same. The best advice we can give you is to talk with an EXPERIENCED personal injury attorney about the facts of your claim. Here at The Law Offices of Gary Martin Hays & Associates our Georgia accident lawyers focus on Personal Injury claims and that gives us the best chance of helping you with the intricate details of your case. Call now for your free consultation at (770) 934-8000 or toll free - 1 (888) 934-8100 or contact us via email: the initial consultation is free.